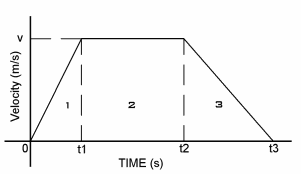 Sometimes it is useful in solving problems in kinematics if a velcoity - time graph is drawn first. Note: The section numbers below relate to those of the graph above. Distance travelled is given by the area under the graph for section 1. Distance travelled: which again is the area under the graph for this section. The acceleration is given by: i.e. the slope of the graph. Note that this time the slope of the graph and acceleration are negative because the body is slowing down.